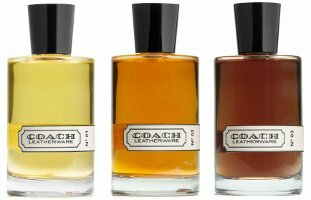 Smelling the Coach Leatherware series makes me wonder why Coach didn’t start its fragrance line with leather in the first place. Leather is a natural for Coach, a company — like Hermès — that started in the tack business. Also like Hermès, Coach expanded to leather bags and belts, then to clothing and perfume. But that’s where Hermès and Coach part company. Although Coach has upped its style quotient, its quality has taken a nosedive in the past decade. (Just try to find a new Coach handbag with a leather lining.) Coach’s fragrances? Entirely forgettable. Leatherware gives me fresh hope for the company. Each fragrance has personality and development, and they stand up to some of my favorite leather perfumes. Let’s go over them one by one. Notes include citrus, coriander, saffron, greens, nutmeg, woods, and baseball glove leather. In short, No. 1 is a whopper aromatic fougère with lashings of coriander, sugared citrus peel, and resinous herbs. Its notes don’t specify lavender, but if it’s not there, then a crafty coupling of cypress or pine and herbs are faking it. The coriander and nutmeg are big here, too, and No. 1’s leather can barely compete. The whole composition remains crisp, clean, and powerful, without much dirtiness, save the coriander. No. 1 is the most “manly” of the three Leatherware fragrances, but in my mind it’s manly like a Hummer is manly. A real man doesn’t need to drive a Hummer in the city, you know what I mean? It seems to be a compensation for — well, this is a family blog, so I’ll drop it there. But to me, No. 1 is a lot of swagger. At least it’s a nice, solidly constructed swagger. Notes include citrus, rhubarb leaves, black pepper, greens, thyme, oakmoss, patchouli, musk, and baseball glove leather. Despite its unfortunate numbering, No. 2 is my favorite of the group and probably the most feminine of the trio of fragrances marketed for men. No. 2’s sneezy pepper kicks off the fragrance, but it’s underscored by warm, sweet wood and greens. A crisp floral heart — ylang ylang? a hint of rose and maybe even violet leaves and jasmine? — cool the fragrance and make its soft leather more approachable. But what’s really interesting about No. 2 is that in its middle is a watery pool of green. It isn’t ocean-like or cucumber-y, but it’s the wet of crushed, green stems plumped with vase water, and it freshens the fragrance without making it feel brisk. Pepper continues to keep No. 2 from getting flabby. The fragrance ages into a sweet, fuzzy sandalwood-suede that isn’t overly clean. Fans of Lancôme Cuir de Lancôme who want something with more tingle might want to give No. 2 a try. Notes include pink pepper, cardamom, lemon, cypress, orris, cedarwood, woods, patchouli, papyrus, vetiver, and — surprise! — baseball glove leather. On first sniff, my brain went straight to Serge Lutens Vetiver Oriental. Vetiver stars in No. 3, and it's inky and chocolaty, warmed by its patchouli and wood. Citrus, cardamom, and resins freshen the fragrance, but they don’t butch it up to the same extent they do No. 1. The sales associate at the Coach store where I made my samples said that No. 3 is his least favorite because it’s “too loud.” To me, No. 1 is louder. I find No. 3 rich and oily, but a dark green vetiver-crude-oil oily and not leather oily. No. 3’s pink pepper isn’t assertive, and the orris is very subtle. If you’re a fan of Lalique Encre Noir, Serge Lutens Vetiver Oriental, or Maître Parfumeur et Gantier Route du Vetiver, you should give this one a try. None of the Leatherware fragrances as dabbed from my sample tube last much longer than four or five hours, but they all have hearty sillage while they last — especially Nos. 1 and 3. They come in simple, chic bottles that somehow look both modern and retro. I can only hope the Leatherware series is a sign that Coach is ready to step away from trying to please the masses with expensive yet cheaply made products and is edging toward a return to craftsmanship and vision. Fingers crossed. Coach Leatherware No. 1, Leatherware No. 2 and Leatherware No. 3 are $95 each for 95 ml. So far, they’re only available at Coach boutiques and online. These seem interesting, thanks for the reviews! I haven’t tried any of those vetivers that you mentioned. You’re welcome! It’s so nice to find something at the mall that stands apart. If you like dark vetiver, the ones I mentioned are good ones to sample, I think. Oh, yay! Angela, so glad you are reviewing these–it makes me want to run down the street to the Coach store and spray some of the third entry on so I can properly discuss… actually I might have to do that, but in the meantime quick thoughts on the first two. I agree completely that these are a bigger step up in quality, and in terms of notes, your characterizations ring very true to me–I think the places where I depart are just a matter of skin/nose variation, with a dash of personal preference. I found the first one very “manly” indeed but happily not so loud. In fact it struck me as a nice alternative to, say, some of the L’Occitane’s men’s scents, where I often like the compositions but find the volume and persistence to be overwhelming–I liked the sense of wearing something distinctly male, but not having to muscle through it. And then the second one, I got some rhubarb from, and thus it felt sort of fruity-watery to me, which is not my cup of tea! (Ha, actually weak fruit tea is not too far off from what it smelled like to me!) But I don’t want to rag on it too hard–I am completely with you that these are all a much higher level of craftsmanship than their usual bailiwick, which is so great to see. And even in nice packaging! Alright, now I definitely have to go smell the last one! Thank you for sharing your impressions! I bet you wear No. 1 well, too. Please do come back and report on No. 3 once you’ve had time to let it settle on your skin. To me No. 1 relates back to some of the larger-than-life leather men’s fragrances of the 80’. Not to compensate for… (although there would have been some of that too) but because fragrances were not supposed to be polite and discreet. No. 1 is more like a distant cousin of Trussardi Uomo or Oscar de la Renta pour Lui. No. 2 did not last on me. It was gone and forgotten in minutes. Unfortunate because the pepper note is nicely done IMO. No.3 is the one that I wanted to buy when I went in. Unfortunately, vetiver and I have a love/hate relationship. Love it in Encre Noir, hate it in Guerlain’s Vetiver. No.3, as you stated, is more about vetiver than leather. I might try it again one day… but since Coach has no samples to offer, (Shame on them!) I’m not sure when that would be. P.S. : Sprayed, No.1 lasts about 6 hrs on me, which is today’s perfume world in an eternity. Another fan of No. 1! (I can tell I’m going to pay for that Hummer analogy….but just know that I’m a fair-skinned redhead, and No. 1 is a bully on my skin.) Great retention of scent, too. It sounds like you found a winner. Isn’t that a drag about the lack of Coach samples? I was eager to try them, so I brought in my own sample vials. The SA was a real darling about making samples for me. I truly love your reviews. Hard for me to admit on such a public forum but despite my love of fragrances, my olfactive memory can be a bit deficient. Example: when reading about a specific note or when reading the words “green” or “woody”, I have a bit of difficulty “imagining” the scent in my head. So thank you again and I hope to read more reviews from you in the future. Often I don’t use the names of materials when describing a fragrance because (1) I don’t know them; or (2) I figure many of the readers won’t know them, either. I try to think about what I’d like to know about a fragrance. I love it! A comment that quotes South Pacific! I loved Coach for decades and still have a couple of Coach bags in my closet. The last ones I bought were two of the early fabric ones (late 90s, early 00s) that were in the original functional, subdued Coach style and solid craftsmanship, but a bit lighter (and less expensive) than all leather. What happened next basically parallels what happened to mainstream perfumery. (And a lot of other things, I guess.) I gave up on Coach and switched to cheap and cheerful Kipling bags, which have served me well. Your review of these new leather perfumes prompted me to look up the Coach website. It looks to me as if the style has shifted in a more classical direction. Interesting! The great thing about the old Coach bags is that they held up so well that it’s possible to find them secondhand and still in great shape. At some point, though, I’m pretty sure Coach moved production to China, and the olden days of the New York state workshop ended. After posting I saw your’s above about the leather being thinner. I’ve been browsing ebay for vintage Filofaxes, too. It’s amazing how the little details have been lost, like the extra bit of leather on the zip pocket that protected the pages from the head of the zipper. That probably saves them ten cents. Another Filofax user! I thought everyone had converted to smart phones and I was the only Filofax holdout. I’m definitely going to cruise online for some vintage Filofaxes. The main one I use is on its last lets. Angela, high five! I thought I was the last one, too, and then today I saw a colleague using the old DayTimer spiral bound monthly inserts! There are not many vintage Filos on ebay at any given time, and it takes patience to find one in good condition. (I do have Auction Sniper trained one as we speak – fingers crossed!) There are more of the recently discontinued ones, and sometimes one can get a good price. OTOH, some discontinued colors are popular and sell for way more than the original price. There are even Filofax afficionado blogs, such as Philofaxy. Uh oh! A whole new world to discover for those of us who like to “hand craft” our calendars. I used to have a package of dinner party planning inserts with the diagram of a table on it so you could plan where your guests sat. I don’t think I even used them, but I loved imagining I would. Thanks for reviewing these! I would really like to try them. I love leather fragrances. I noticed you made your own samples at the boutique. I recently asked for samples as I made a purchase, and the SA said they don’t have any samples. Craziness! I had a huge tuberose as SOTD, so did not try any on skin. They could use some education on marketing Maybe I’ll be brave enough to ask to make my own samples one day. Be well. Sometimes making my own samples is the only way I can try things nowadays! Really, though, these fragrances develop enough that you have to be able to live with them for a while on skin. It’s not reasonable to expect someone to spray one on and make an instant decision. Came over here for some other reason, and found your awesome reviews of these new scents. I will be excited to try all of them, but I am leaning toward no.1 already! Muchas gracias! They really are worth sampling if you like leather, in my opinion. I hope you find one you love! I smelled all three when they first came out and if I recall, I liked #3 the best. It’s too bad there are no samples to be had but good that you were able to get your samples by bringing your own vials. I think I will try that the next time I’m at the mall. The stores have a 25% off sales on EVERYTHING several times a year, as long as you have one of those discount postcards or go with someone who does. For some weird reason, I stopped getting them but the SAs have been very nice to me (sales is sales even at 25% off) and allows me the discount even without the card. I, too, lament the lower quality leathers. I’m probably dating myself here but does anyone remember when each bag had its own serial number stamped on an inside pocket? Oh, and their lifetime guarantee is really lifetime guarantee. I’m rough on my bags and one of them had been to the Coach Bag hospital 3 times in the past 15 years and each time it comes back, it looks like new but still feels like my old friend! YES! I remember the serial number and the little booklet with photos of Coach bags being made in New York. I think someone should do a coffee table book of the old Coach bags. I know I would spend a few hours perusing it. Yes, I definitely remember the serial numbers. I remember sending an old bag to the “hospital” (love that term) for new bindings, and getting it back fresh and strong. I love the really old designs, the Bonnie Cashins, too. I liked all of these, but No 2 was my favorite. I thought it was kind of a boozy leather with some similarities to Lubin Idole. The other two were less about leather. No. 3 was patchouli centric on me, and No. 1 was pretty much as you describe. I dont think i would want to smell any of these on a woman though, sorry. I liked No. 2 best, too, and I wouldn’t hesitate to wear it!